Reviewing Authority Recommendations: 1. Recommender concurred with the commission's finding of guilty of the accused for the entire charge of Specification 3 - did not believe that the accused only slapped the prisoner. Defense Arguments: 1. Accused looked out for the welfare of the prisoners over and beyond what was called for. 2. 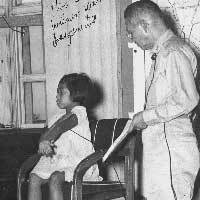 Did not receive instructions about the treatment of prisoners of war as set forth by the Geneva Convention, nor did he know about Japan's agreement until after cessation of hostilities. 3. Did not carry out the punishment of prisoners forced to stripped in order to confess who had traded accused's watch for food. Judge Advocate's Recommendations: Defense objection to official communication between Japan and the U.S. was properly overruled because "it was admitted into evidence to be considered insofar as the commission could determine its effect in relation to the laws of war." What does this mean? I'm not sure how it is supposed to apply.